Chocolate Almond Banana Bites. These chocolate almond frozen banana bites are so good! I wanted to incorporate the flavors of my 5 minute banana ice cream, which I seem to make at least a few times a week. These frozen chocolate treats are so healthy and it feels like you are cheating! No ice cream maker necessary! This recipe actually won a contest on The Today Show. These chocolate almond banana bites contain no added sugars, except for the small amount of sugar in the dark chocolate. 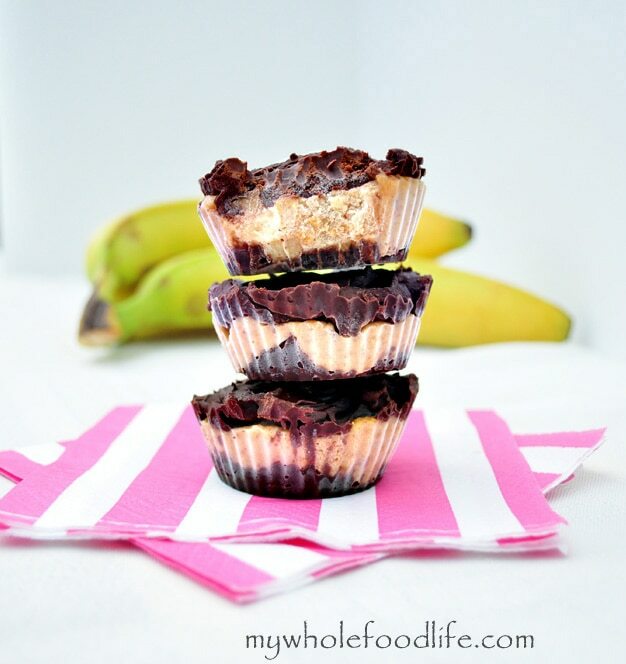 They are a great banana chocolate dessert to keep in your freezer when you have that sweet craving. I used standard sized muffin cups to make mine, but you can also use mini cups and make a larger, bite-size batch. Satisfy your sweet tooth with this healthy treat! In a small bowl, mix the banana, vanilla and almond butter. Mash it together well and set aside. In a saucepan, , melt the chocolate and almond milk on medium heat, stirring constantly. Once you get a smooth chocolate, add a small amount to the bottom of a lined muffin tin. I used silicone muffin liners to make removing the chocolate easier when it’s time to eat. Once you have placed chocolate at the bottom on each cup, stick it in the freezer to firm up. About 10 minutes. Once the chocolate is firm, add in the banana filling and then cover the top with more chocolate. Using standard sized muffin cups, I got 6 out of my batch. I store them in the freezer. Enjoy! I just have to say, your blog is one of my absolute faves, everything you create is something that I cannot wait to make. Thanks for all the recipes! Thanks Lisa! I hope you enjoy this one as well! These were amazing. It took patience to wait for it to set up, but well worth it. I would make them in the morning before work, so it would be ready in the evening. I love your website and have made several of your recipes. They all have been great. Thanks Jaclyn! I am glad you liked them. oh my. I was just wondering last night if I could make dark chocolate covered almonds or something else delicious with ingredients I have at home that would be easy. I'll have to substitute almond butter for peanut butter but I'm going to try to make these after our tempeh "bacon" sandwiches. Thanks for this recipe! You're welcome Crystal!! Tempeh bacon sandwiches sound pretty awesome too! Omg! I can see why these won! They are AMAZING! My 7 year old could have eaten the whole tray. Thank you so much for all your recipes. I love making healthy foods, especially treats. And I appreciate your hard work so that we can have delicious healthy foods too! What is the nutritional content of these? It looks to me if I figure it right that if there are 6 muffins they contain 325 calories each and 22 gms of carbs. That doesn't seem healthy to me just because there is little added sugar. I don't count calories personally. You can make them into mini muffins if you want. That would cut the calories down for you. I know this is an old comment, but I just had to leave a reply. I've tried many diets which required counting and measuring, but only had limited success. I went vegan, gluten-free for medical reasons (autoimmune diseases), and lost 20 pounds in 2 months without even trying or ever feeling deprived or overly hungry. But to top that, my symptoms are under control, and I've been able to discontinue almost all of my medications; thus halting my kidney damage. This diet is a healthy diet, and calories don't count. Thank you Melissa for your wonderful recipes!